Today I am thankful for all of my wonderful blog readers, friends and family. I wish you all a very happy Thanksgiving. Have a wonderful holiday, wherever you are spending it. Be safe and enjoy! Gorgeous! LOVING the leaves! Happy Thanksgiving!!!!! 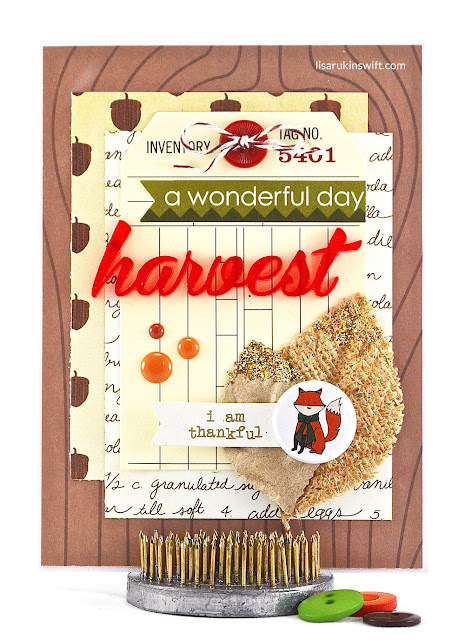 Great layering, Lisa, and I love that cute little fox. Happy Thanksgiving! Love the different textures! and the adorable fox. Awesome card. I love all the textures. You always do such a great job layering pieces together. I hope your family had a wonderful holiday.